HONB has been reported as the additive of choice for water solid-phase peptide synthesis (SPPS). Active esters derived from hydroxamic acid, such as HONB, have also found broad application. The first were the O-phthalimido esters, which release a water-insoluble side product. However, these were soon replaced by the more versatile succinimido esters (OSu). 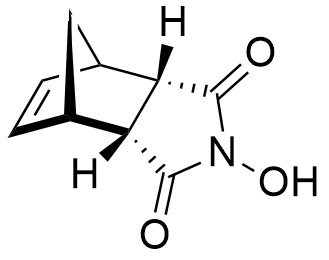 The latter generate watersoluble N-hydroxysuccinimide, which is straightforward to remove from target peptides. A. S Galanis, F. Albericio, M. Grøtli Org. Lett., 2009, 11(20), 4488-4491.